Authentication and authorization is a tough topic. Every developer at a certain point faced the challenges of having to protect some kind of web app, restricting access in some way. Thankfully the ways of doing this are many, but this means that you still need to pick the most appropriate one for your situation. At Contentful, that meant using OAuth2. As the de facto standard, it was simply the choice that made the most sense. However, OAuth2 certainly isn’t the most immediate solution to get started: obtaining a valid token requires you to do certain steps such as hosting an app on a secure server, and for development purposes, that might be an overkill. This is why we implemented Personal Access Tokens, as a way to make the CMA even more accessible and easy to pick up and run. They are a widespread standard used across well known organisations or services, such as Github. What is a Personal Access Token and when should I use it? Personal Access Tokens are an easier alternative to regular OAuth tokens. Technically, it allows access to our CMA, and just like a OAuth token, it is tied to the user who requests it, meaning that they will have the same permissions as the user (in terms of access to organizations, spaces and content). The difference is subtle but important: with OAuth, you authorize an app to talk to Contentful on your behalf, and might not ever see the credentials that the app uses; on the other hand, with Personal Access Tokens you are in charge of asking for the credentials to the API, and subsequently managing them. Whether you should use Personal Access Tokens or regular OAuth tokens highly depends on your use case. OAuth apps allow other users to authenticate against Contentful in order for your app to use the issued token. Personal Access Tokens are managed by the user, which means that they are tied to a single Contentful user account. This makes Personal Access Tokens good candidates for development, as well as automation purposes, when an application does only require a single Contentful account to manage content. 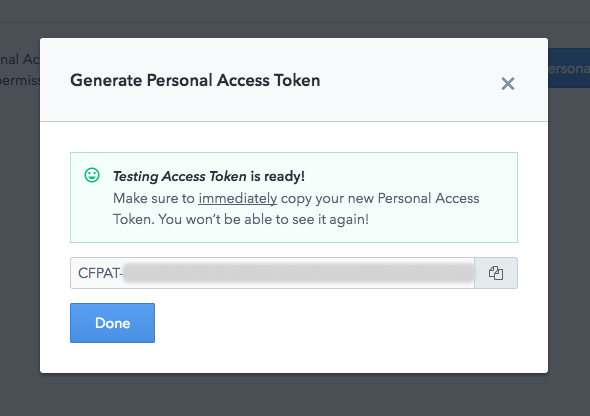 The response will contain the newly generated access token, but be careful: this is the only time you will be shown the Personal Access Token, so make sure you store it somewhere. The final endpoint is for revoking the token. To do so, make a PUT request to http://api.contentful.com/users/me/access_tokens/<tokenId>/revoked. It’s important that you copy the actual token: as with the normal API requests, you won’t get access to it any more after closing this window. After creating a token, you will see it (along with all previous tokens you created) in the same page, where you will have the ability to revoke them. This was another step in the our never-ending effort for great a developer experience. We believe this will make starting using Contentful even easier, for first-time users and seasoned Contentful aficionados alike, so get your shiny new Personal Access Token and happy developing!